If the measure of good (or even decent) literature is that which is capable of evoking emotion, well, Go Set A Watchman sure does that. You start with nervous anticipation, you laugh a bit, you're bored at times, you're wistful, you're infuriated, you're sad, you're challenged, you put it down when you're finished, almost with a sense of relief. I can't possibly review this book. No one really can because it's not a complete novel. But I am willing to try my hand at starting with the basics, and moving into some more complicated thoughts on the book. Here is my take on the six most common questions about Go Set A Watchman. 1. What is Go Set A Watchman? — It's an unedited manuscript that tells a story taking placing 20 years after the events of To Kill A Mockingbird. When Lee submitted Go Set A Watchman for publication, an editor told her to rewrite, but focus on flashbacks to Scout's childhood instead. The rewritten novel is To Kill A Mockingbird. So Go Set A Watchman is essentially a first draft of To Kill A Mockingbird. We can tell this is true in several places as we read Go Set A Watchman. For instance, in Go Set A Watchman, in a brief gloss-over paragraph of the trial central to To Kill A Mockingbird, Lee tells us Atticus got Tom Robinson acquitted. Obviously, she changed her mind as she wrote To Kill A Mockingbird. 2. What isn't Go Set A Watchman? — Despite some of the marketing and media hype, it's NOT a sequel to To Kill A Mockingbird. A sequel implies intent that a novel be written to build on the events of a previous novel. That's not what happened here. It was not intended to be a sequel, and it's not. 3. Should Go Set A Watchman have been published? — I have no idea. I'm glad it was, but we'll never actually know for sure what Lee's desires were regarding this "suddenly found" manuscript. As Jeff of Book Riot writes in this fantastic post when Go Set A Watchman was first announced, the tack to take is just to be comfortable reading knowing we won't have definitive answers. The nearest reading experience I can point to to this is David Foster Wallace's posthumous manuscript, The Pale King. Did he want that published? We'll never know. But we're happy it exists, and sad that it could've been so much better. 4. Will reading Go Set A Watchman ruin To Kill A Mockingbird? — No. No it unequivocally will not. You've probably seen all the Very Important Think Pieces, even from respected media outlets like NPR, making the case that the Big Reveal — Atticus is an old grouchy racist now — somehow kills the moral Atticus who is the paragon of empathy and ethics in To Kill A Mockingbird. That's wrong-headed and simple-minded. This isn't a case of Schrodinger's Atticus — you don't kill one Atticus by reading about the other Atticus. Both Atticuses (Atticki?) actually can exist simultaneously and in perpetuity. (So I guess it IS a case of Schrodinger's Atticus.) Remember, Lee went back to the drawing board on Atticus, so keep both Atticuses in your head — it's not cognitive dissonance. I realize it's tempting to let GSAW Atticus redefine TKAM Atticus — especially as Scout delivers lines like "You who called me Scout are dead and in your grave," which is absolutely heartbreaking — but don't. I strongly believe it's not the right way to read this book. 5. Is Go Set A Watchman any damn good?— I don't think this is quite the right question, but it's the most common one. To try to answer: It's pretty solid for a first draft. The too-easy comment I've heard frequently is that this could've been a masterpiece if it had been edited like a "normal" novel. But of course, it did become a masterpiece with an editor! That's what To Kill A Mockingbird is. As it stands, there are some major issues with Go Set A Watchman, just from continuity and "logic of storytelling" standpoint — we're missing some things (possibly things pulled out to form the framework of To Kill A Mockingbird?). And the last 100 pages...well, they're just not good storytelling. Scout has three separate conversations with three characters, Atticus as the denouement, to try to find out why Atticus is racist. While these conversations are philosophically and politically complex (go brush up on the 10th Amendment and Brown vs. Board of Education of Topeka), they just don't quite rise to the level of literature. 6. Did you like Go Set A Watchman? —To sum, yes, I liked it, but with reservations — and to be clear, this is a much different question than No. 5. My favorite parts of this novel are three flashback scenes to Scout's childhood and teenage years. All read exactly as if they're torn from To Kill A Mockingbird — they're all really funny, and in at least one case, show us the affable Atticus of To Kill A Mockingbird. I can't emphasize enough how much I loved these scenes. The closest analogy I can come up with here, which certainly pales in comparison with this reading experience, is the Curb Your Enthusiasm's Seinfeld reunion episodes — there are extended parts of those where the cast dropped right back into Seinfeld mode. In these three scenes, we're right back to To Kill A Mockingbird, and they're just so great as standalone set pieces. In total, it was a mostly positive reading experience, and I'll certainly recommend it to anyone who is on the fence. I'm very glad I read it. Finally, my thoughts on it mirror the fantastic point made by Book Riot manager editor Amanda when she appeared on CNN International to discuss the book — when the Go Set A Watchman frenzy has died down, it'll wind up as simply a footnote in literary history. To Kill A Mockingbird is now and always will be unassailable. I agree with all of your points,Greg-GSAW is a good book, not a great one, and worth reading if only to see where the genesis of TKAM came from. Too many people are wringing their hands and wailing "This is not my Atticus!" and to them I say "Well, you're right because Atticus doesn't belong to you. He belongs to Harper Lee, just like Huck Finn belongs to Mark Twain." Authors, in my opinion, share their characters with us and while I can sympathize with seeing a fictional person that you feel you know and love take a wrong turn, but getting mad because the writer chose to take a different tact(in this case, an earlier conception) for dramatic purposes is a bit much there. Totally agree - it IS a bit much. Read and judge a book for what it is (in this case, a draft, NOT a sequel, with a racist character) not what you want it to be (an actual sequel with a beloved character). I think it's an important literary event, a more realistic story that TKAM, but still a poorly written book. 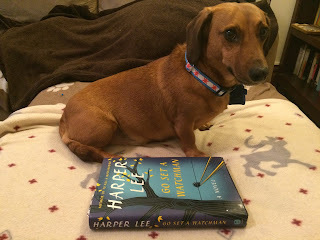 If Harper Lee wasn't well, Harper Lee, I'd brush it off. Maybe in its total construction, I'd agree with you that it's poorly written. But her writing itself is just masterful - even as she's veering off onto tangents or trying to cram a doctoral dissertation on race relations into a few pages of dialogue. Thanks for taking this approach to writing about GSAW! I've been on the fence about reading it, but I think I'll give it a shot once the hype dies down.